Sweet Potato Nachos are loaded with good for you toppings like corn, beans, and avocado and are super delicious. The easy to make baked sweet potato chips replace the usual calorie-heavy corn chips in this recipe. They're perfect for a casual dinner or as a healthy Super Bowl appetizer. Raise your hands if you LOVE nachos. Truth is, I've been eating far too many nachos lately. It's not my fault. Not at all. They get put in front of me and I'm totally unable to resist them. What chance do I stand? It got me thinking about how I could reinvent them so we could pig out on nachos AND feel good about it. And that, my friends, is how these loaded sweet potato nachos were born. I started by making my own sweet potato chips. Don't worry, they're super easy. All they are are thin slices of sweet potatoes that are baked in the oven until crispy. Super simple and super healthy. Once I got the calorie-heavy corn chips out of the way, the rest was pretty easy. I topped the sweet potato nachos with some corn, black beans, onions and a little cheese then made a simple guacamole while they were in the oven. Easy. Delicious. Healthy. Triple win! There's something you guys need to know about this recipe … it's basically a two in one. You see those sweet potato chips there?☝️ Ya, those. They are delicious enough to eat on their own. If you're wanting a healthy snack to have on hand, these are perfect. You're going to want to slice the sweet potatoes as thinly as possible. Thin = crispy. Thick = chewy. If you have one, a mandolin is perfect for this job. Use your hands to mix around the sweet potatoes with the oil. You don't need a lot of oil, but a little bit helps them get crispy. You want to make sure each piece is lightly coated. Feel free to experiment with the spices. For the sweet potato nachos, I like to keep them simple with a little sea salt. Cayenne, cumin, and curry would all be delicious, too. They take a long time to cook, but once they get close to finishing they can go from almost cooked to burnt very quickly. Keep a close eye on them near the end. As you're checking on them, remove any that are brown. Remember that they will crisp up once they cool down. Swap the homemade baked sweet potato chips for store-bought. It will take the healthy part out of this recipe, but it will make it super quick and easy to throw together. Use refried beans instead of the black beans. Add some diced tomatoes or red peppers. Get super crazy and add some grated carrots. Or sprinkle them with pomegranate. Top them with pulled pork, chicken or some crumbled tofu. Swap the cheese for vegan cheese. Or leave the cheese off entirely. Or (better yet) add tons of extra cheese and lots of different kinds. 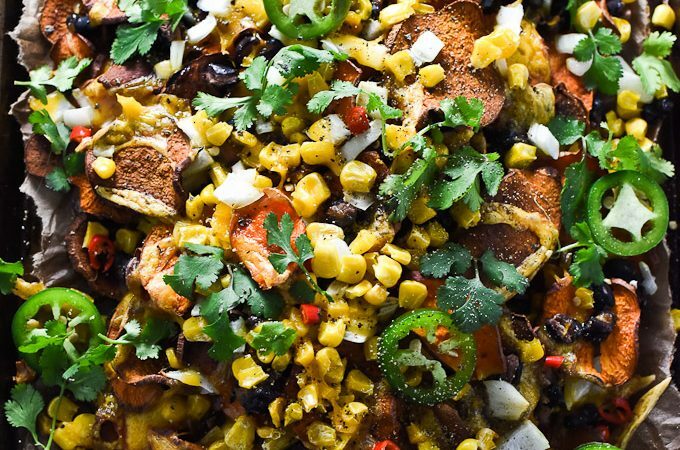 How would you customize your sweet potato nachos? If you make these Loaded Sweet Potato Nachos make sure you snap a pic and tag @theendlessmeal on Instagram so I can like and comment on your photos. I love seeing TEM recipes you create! Sweet Potato Nachos are loaded with good for you toppings like corn, beans and avocado and are super delicious. Easy to make baked sweet potato chips replace the usual calorie-heavy corn chips in this recipe. They're perfect for a casual dinner or as a healthy Super Bowl appetizer. Preheat your oven to 300 degrees. Line 2 11×13 baking sheets with parchment paper. Wash the sweet potatoes well. There's no need to peel them. Slice them as thinly and evenly as possible. If you have one, a mandolin is perfect for this job. In a large bowl, toss the sweet potatoes with the grapeseed oil and sea salt. Lay the sweet potatoes out on the prepared baking sheets in a (mostly) single layer. You can overlap them just a little if you need to. Bake them in the oven for 1 1/2 hours. Remove any chips that are starting to brown and continue to bake them, checking and removing any that are brown every 10 minutes, until all are light brown and or crispy at the edges, about another 1/2 hour. Remove them from the oven and let them cool and crisp. Turn your oven up to 350 degrees. Place the frozen corn and the black beans on a baking sheet and roast them in the oven for 10 minutes to dry them out. 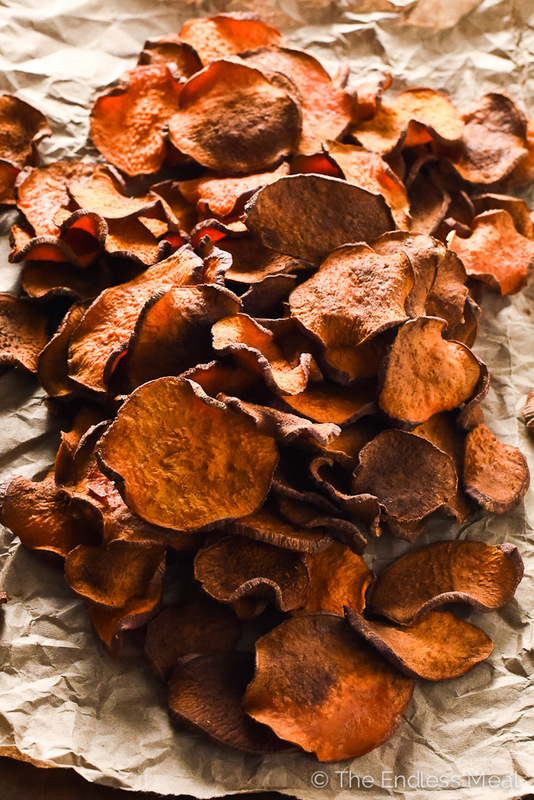 Once the sweet potato chips are cool, pile them all onto one of the baking sheets. Top them, in 2 layers, with the roasted corn, black beans, onions, and cheese and bake them in your oven for 10 minutes, or until the cheese has melted and begins to crisp. While the nachos are in the oven, prepare the guacamole. Place all the guacamole ingredients in a medium size bowl and mix with a fork until combined but still chunky. When the sweet potato nachos come out of the oven, top them with any or all of the optional ingredients and serve with the guacamole. *Any melting cheese works well on nachos. I always like to use aged cheddar. **If you eat a plant-based diet, omit the cheese or use your favourite vegan version. Is it 300 degree C or F? thanks. Holy smokes, Kristen, you come up with the most beautiful creations. Those chips! I could eat those every single day. Now the toppings are perfect and will be a big hit with everyone – so much yumminess! I find more and more people are asking for game day treats that are healthy and I get so excited about that! Finally!! It’s so nice to have treats that leave you feeling good after eating them, isn’t it? It’s my fav. Hope you have a great weekend, too! Hope you like them as much as I do!! I just love them, too! So sweet and delicious! !